The Film Corner with Greg Klymkiw: African Phantasms: New African Short Films - Review By Greg Klymkiw - As part of Black History month, the TIFF Bell Lightbox is presenting a major series entitled "Music, Magic, Clash: New Voices in the African Diaspora". This program of short cinema displays the sort of artistry and maturity lacking in so many Canadian and American short films that are often little more than "calling cards" for features or worse, the horrendous, "Look Ma, I can use a dolly. Hire me to direct bad TV." African Phantasms: New African Short Films - Review By Greg Klymkiw - As part of Black History month, the TIFF Bell Lightbox is presenting a major series entitled "Music, Magic, Clash: New Voices in the African Diaspora". This program of short cinema displays the sort of artistry and maturity lacking in so many Canadian and American short films that are often little more than "calling cards" for features or worse, the horrendous, "Look Ma, I can use a dolly. Hire me to direct bad TV." TIFF Bell Lightbox: ""Music, Magic, Clash: New Voices in the African Diaspora"
I consider short films a genre unto themselves - a form of storytelling with its own unique set of rules (or, when rules are broken, their own unique parameters waiting to be burst open). This excellent series of short films from Africa is playing for one show only at the TIFF Bell Lightbox cinemas in Toronto, and at press time, only three of the five shorts were available for review, but if they're any indication of what I'm missing when they're all screened publicly, I think it's safe to say that this is a series that deserves to be toured as widely as possible and for those living in Toronto, it is absolutely NOT to be missed. While these films are generated by "new voices", what struck me about the three shorts I did see is that they're actually ABOUT something. Having seen thousands of short films in my life (and far too many of them Canadian), I'm constantly distressed to see movies that are little more than "calling cards" for features or worse, the horrendous, "Look Ma, I can use a dolly. Hire me to direct crappy TV." There is this really appalling sense of "careerism" in Canadian and American short cinema - films not being made because they HAVE to be made, but because far too many basement dwelling rich kids think filmmaking would be a better "career choice" than having to work for a living. This attitude is supported by far too many educational and training institutions to keep tuition fees flowing in and/or to maintain their relevance/existence (and to keep things nice and cushy for the nest-featherers who administer such programs). Cinema, however, is a calling - it's not a "career choice". Cinema chooses YOU! When a film is to be made, it should be made with the sort of passion and belief that the story MUST be told and that not doing so would render its maker doomed to a kind of artistic purgatory until it IS made. It sometimes sickens me when I realize just how many short films I have seen - especially from North America. The dross I've subjected myself to includes (but is not limited to) pallid rip-offs of John Hughes, Wes Anderson and/or Quentin Tarantino, juvenile philosophical dark ramblings that should have been left in the trash bin of the Existentialism 101 classroom and most horrific of all, the "joke" short - one in which the punchline, or "twist" is what drives the film. In any event, do yourself a favour and catch the shorts in this series. Hopefully they'll be coming to a theatre near you beyond the borders of downtown Toronto. Here are brief reviews of the three I have seen. The film begins, as does Coco's (Ricky Tribord) day, with the ritual of washing. From within the interior of a car we watch as soapy water splashes luxuriously upon the windshield while a sponge sweeps back and forth, removing the dust that's settled upon it from the previous day. In a tiled shower, water cascades down Coco's leg as he bends down to meticulously wash his feet, taking care to scrub between each toe on each foot. He dresses and regards himself - it seems he might be going out on a date or have an important meeting. His brief reverie is shattered when a text message comes from his landlord that he's seven days overdue in paying his rent. No date. No meeting. Just another normal day for this Yaoundé cab driver. Luckily, his first fare of the day suggests his debt-load might be lightened and, for good measure, his dour spirits. A friendly, attractive young woman (Mata Gabin) sits primly in his back seat and she's headed for the airport. He flirts with her good-naturedly - the banter worthy of any fine romantic comedy - but alas, things in life are not always what they seem. This is, one of the film's primary narrative strengths. It delights us with what at first seems like a romance, then moves deftly into borderline absurdist humour and finally into a deeply and profoundly moving dénouement. With the sage assistance of an airport security guard (Daniel Ndo) Coco learns, as do we, that sometimes a cassava is just a cassava - nothing more and nothing less. 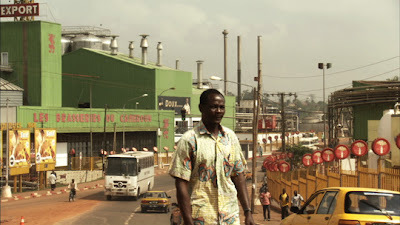 And much like the cassava plant, which can grow heartily in dry, drought-prone climates, the film offers a glimpse into the resiliency of humanity within a continent that yields so much of this bittersweet staple. 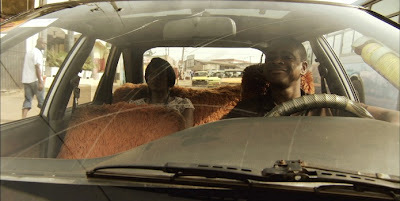 Efficiently directed, beautifully acted and written with humour and tenderness, The Cassava Metaphor is one of the finest short dramas I've seen in many years. For experimental cinema to soar to the heights of great poetry, the images must be powerful, the rhythm impeccable and the structure very sound. Drexciya succeeds magnificently on all these fronts. The film directs its gaze upon the crumbling ruins of a derelict Olympic-sized swimming pool in Accra, Ghana. The topography surrounding the pool is flat, dusty and dry. In the distance is a building that looks unfinished. Local residents gather at the empty pool to dryy their laundry or just pass the day. Director Akosua Adoma Owusu then places her camera to capture what seems like every crack and crumble and refuse located within the faded green tile of this long-abandoned pool. Finally, she focuses upon the rusting tower of what was once an Olympic-sized series of diving boards. Like some massive crucifix dominating both the frame of the camera and the big sky of Ghana. Up to this point, the soundtrack has been replete with both the sounds of the natural world of the pool brilliantly mixed with sounds of what must have been when it was in operation. In this finale, focusing upon a cross-like structure - so infused with the notion of indignity, sacrifice and resurrection - the powerful African-American spiritual "Wade in the Water" takes over the soundscape. Sound and image blend perfectly and while watching it, I felt the gooseflesh rising mightily indeed. Both the rhythm and structure of the film leads you to this point so cannily and expertly that the poetic strength of both sound and image yield an extremely visceral and emotional response. I suppose it didn't hurt that I'm extremely familiar with "Wade in the Water". I first heard it as a kid in a movie (I wish I could remember which one) and then as a teenager, I found a great recording (for those who need to know, the long-defunct "Records On Wheels" on Portage Avenue in Winnipeg) - perhaps even the same one used in the film - on vinyl, and almost wore out the album from playing it so many times. The song dates back to pre-Civil War America and its lyrics urge the African-American slaves to avoid the flat ground and hit the water to avoid the trusty noses of the slave-traders' bloodhounds. Ironically, the album was lost to a flood in my parents' home some years ago. In any event, this is a picture that worked precisely on a poetic level and is an example of cinema's truly great potential to move beyond that of a bauble. Interestingly though, while I don't think I especially misread the film on a first viewing, I discovered after seeing it, that the film is inspired by the 90s Detroit-based electronic group Drexciya who created within their music the myth of an underwater world a la Atlantis which was populated by the spirits of babies born to African women that had been thrown off slave ships bound for the Americas. Knowing this merely added to my appreciation of the film on a repeat viewing. 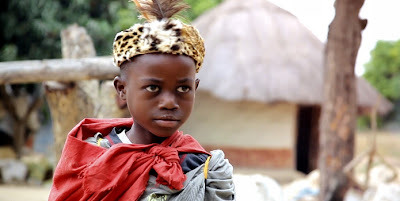 I normally have an aversion to short dramas that act as "calling cards" for feature films - especially when the shorts just feel like truncated features - but The Adventures of Mwansa the Great is one of those rare instances when a short film works perfectly as such, but frankly, is so entertaining that one wants to see more. I have absolutely no doubt that there is a first-rate feature that could even be franchised from this material. It's that good! Set in a dry, seemingly-water-bereft (this seems to be a recurring motif amongst all of these shorts) village in Zambia, a group of children enact the most delightful adventures based on characters that have been told to them by their late father. In full costume, they romp and play with abandon. When Mwansa (Samuel Mwale) accidentally breaks his sister Shula's (Owas Ray Mwape) doll, she is utterly heartbroken. It was crafted from "magic mud" by their departed Dad. Never fear, Mwansa truly believes he is Mwansa the Great (a sort of mythic superhero) and he leads Shula and the rest of the kids on an odyssey to retrieve more "magic mud" to repair the doll. The clay is, in actuality and movingly, slag from the nearby copper mine where Dad worked (and presumably died). Blending the real-life excursion with the fantasy elements that spring to life, we're led on a delightful, heartfelt journey wherein many obstacles must be overcome to reach the quarry. And, let it be said, that through the power of imagination, a little boy believes he can truly fly. I started watching this movie with two ten-year-old girls preparing meringue cookies behind me. Within seconds, they abandoned their culinary activities and joined me on the chesterfield. They, like I, were utterly entranced. As the end-title credits hit the screen, my daughter yelped out, "Wow, Dad! That was a great movie!" "African Phantasms: New African Short Films" is playing at TIFF Bell Lightbox in Toronto for one show only Sunday February 19 at 7:00 PM. In addition to the aforementioned shorts, two others will be screening ("The Deliverance of Comfort" by Zina Saro-Wiwa and "Hasaki ya suda" by Cédric Ido"). For further information and tickets, click HERE.